Blood is drawn from a vein. 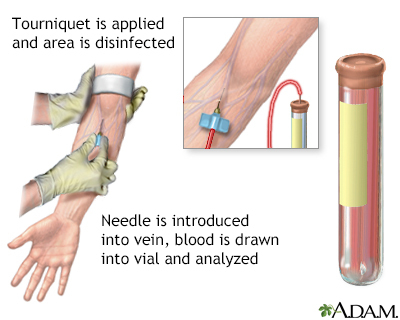 Most often, a vein from the inside of the elbow or the back of the hand is used. A complement test may be used to monitor people with an autoimmune disorder. It is done to see if treatment for their condition is working. When the complement system is turned on during inflammation, levels of complement proteins may go down. For example, people with active lupus erythematosus may have lower-than-normal levels of the complement proteins C3 and C4. The normal range is 88 to 201 milligrams per deciliter (mg/dL) (0.88 to 2.01 g/L). The complement cascade is a series of reactions that take place in the blood. The cascade activates the complement proteins. The result is an attack unit that creates holes in the membrane of bacteria, killing them. C3 attaches to bacteria and kills them directly. Chernecky CC, Berger BJ. C3 complement (beta-1c-globulin) - serum. In: Chernecky CC, Berger BJ, eds. Laboratory Tests and Diagnostic Procedures. 6th ed. St Louis, MO: Elsevier Saunders; 2013:267-268.